The joy of working with “more capable others” (Vygotsky, 1978), well, specifically one “more capable other”, Jane Challinor. With the oldsmooc focus this week on design representations and their value in enabling design thinking, discourse and sharing, just look at what Jane produced so that we’re now able to do exactly that (see her blog post for the details). 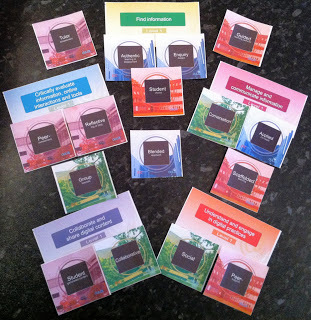 Course features cards and digital literacy facilitation cards amalgamated by Jane Challinor. The design project, that thus far we’d been working on in a fairly simultaneous fashion, really seemed to come together this week, and it was due to a combination of endeavour and serendipity. Having worked through the activities and looked at the course resources, I decided to use the Course Features Cards to help visualise what elements our course might consist of. I duly selected 12 elements, posted my choice in my learning journal and informed Jane that this was how I was thinking. I was curious to see to what extent Jane’s choice of course elements would match mine. At 6.47 pm on Friday, shortly after I’d finished the task, a tweet arrived from Rebecca Galley to say that “hot off the press “a set of Digital Literacy Facilitation Cards were available for use. Then, on Sunday, when I returned to look at the project again, as if by magic both sets of cards had been sorted and amalgamated to reveal what the Digital Literacies and Professional Skills module would actually look like. The only real clarification that was required between the two of us was in relation to a course element that I’d labelled as a wildcard, namely “specialist literacy support/coaching/mentoring”. Here, I explained that I thought there needed to be a supporting presence within the institutional VLE and amongst the social web applications that the module might utilise. Namely, someone who could model appropriate practice and guide learners as they venture out onto the open web professionally; someone who could nurture discussions about various aspects of digital literacies, professional identity and academic practice. This relates back to my point earlier in the course that technologies can no longer be considered as tools, rather they’re sites of practice where people go to converse and to learn. So to me it makes perfect sense to put a real person, a digital literacy coach/mentor, right in there where the practices that we’re interested in developing actually happen and thus providing really effective support. In my mind, this point about support and guidance correlates to the pedagogical approaches that might be adopted within the module. In Grainne Conole‘s presentation, the 7Cs of Learning Design, the word vicarious jumped out at me. The concept of “vicarious learning” was originally defined by Bandura and equates to the notion of learning through other learners’ understandings. Here, Grainne kindly pointed to the work of Terry Mayes who had taken this concept to look at how watching videos might be used in this context. But, for me the word vicarious triggered connections to the work of Neil Mercer, which focuses on the role of dialogue within the “intermental zone of development” [IDZ]. Drawing on Vygotskian concepts of “scaffolding” and the “zone of proximal development” [ZPD], Mercer proposes that the IDZ is not a characteristic of individual ability but rather a dialogical phenomenon, created and maintained between people in interaction and through which “vicarious consciousness” (Bruner’s “vicarious learning”) is realized. Therefore, in the context of our learning design, I think it would be extremely prudent to develop dialogues not just scaffolded by a seemingly “more capable other” i.e. the tutor, but also to design for communicative processes between the learners themselves and allow for vicarious learning to take place as well.